Spanish painter. 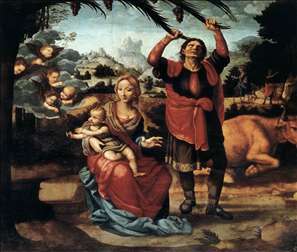 He and Fernando Yez (Yez de la Almedina) are first recorded in Valencia around 1506, painting in a style originating in Florentine art and the work of Leonardo da Vinci, although it is also recorded that in 1505 a Fernando Spagnuolo was receiving payment for work on the cartoon for Leonardo s Battle of Anghiari (1503-08; destroyed; copy, Florence, Uffizi). 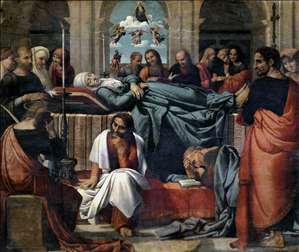 Although there is no documentary evidence to show that the two trained in Italy, it seems likely in the light of the innovations that they brought to Renaissance Valencian painting, including models derived from Leonardo, and a preference for scenes with monumental architecture in which figures are symmetrically arranged in parallel planes in the Italian manner. It is difficult to distinguish between the styles of the two artists, as the differences in their work are slight, although it seems that Yañez was the more gifted. He conceived his figures with greater monumentality, and his work was more classical and serene, painted with a greater clarity and breadth of composition than that of his colleague. The figures painted by Llanos are smaller and more restless and are sometimes unusually proportioned. 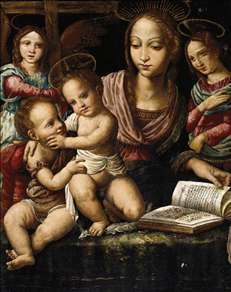 See more details about "Rest during the Flight to Egypt"
See more details about "Death and Assumption of the Virgin"
See more details about "Virgin and Child with the Infant St John the Baptist, Attended by Angels"